A few weeks ago, I was scouring the Library of Congress Print & Photograph Online Catalog for work. I was looking for images of western culture and song--mostly cowboys and Texas fiddling and pow-wow drum, but I was having so much fun looking at those old photographs that I decided to put in a few search terms that were of a more personal interest, namely "pie" and "doughnuts" (another baked good favorite). 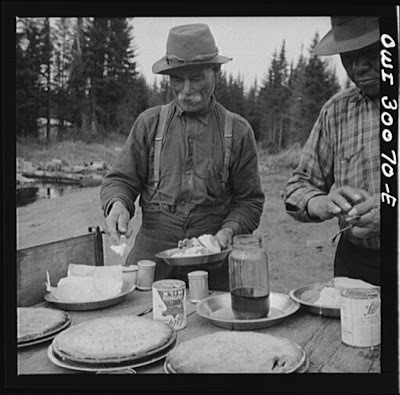 The search yielded exciting results--historical images of a little girl feeding doughnuts to a bear cub, national doughnut queens and pie contests and socials. One group of photos combined these two queries--a collection of images by John Collier from May 1943 of Maine loggers and woodsman on a Spring pulpwood drive on the Brown Company timber holdings. 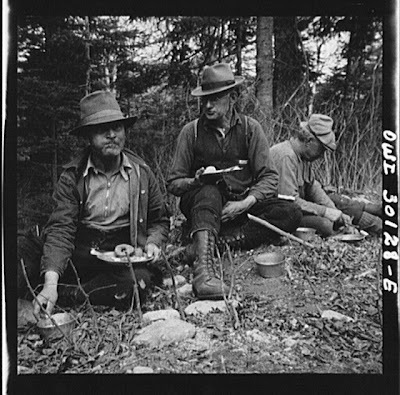 According to the photos' captions, the woodsmen ate four meals per day, with the two "lunches" at 10am and 2pm served "on location", cafeteria style into individual pie tins. Desserts included "several kinds of cookies, gingerbread, doughnuts, and two kinds of pie." Hmm... that dessert menu sounds familiar... Maybe we should start serving our doughnuts out of barrels too. 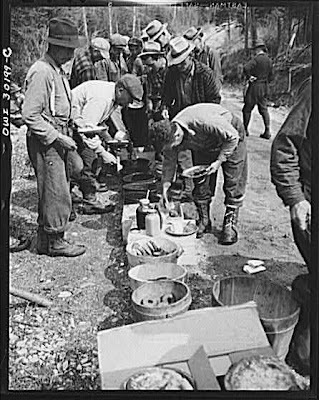 In the above picture, "Cookie" the cook's assistant is dishing out pie at the mid-morning lunch near where the men are working. 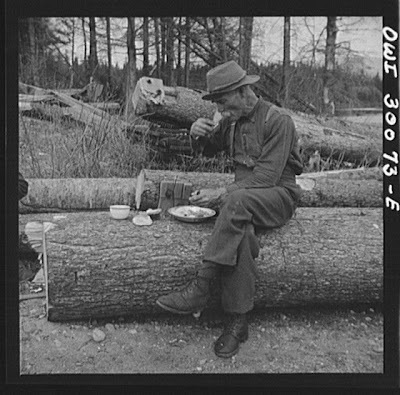 Below, a woodsmen enters the Pie Enjoyment Zone during his mid-afternoon "lunch" by Long Pond. On the menu that day: roast pork and dressing, boiled potatoes, turnips, baked beans, hot cakes, hot biscuits, bread, butter, cookies, apple pie, orange pie, milk, tea, coffee, and water. These men must have been working hard. I also wonder what that orange pie was all about? 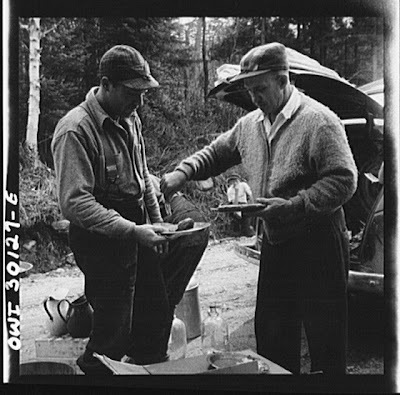 Based on the limited knowledge I have of New England foodways, mainly from folklore and literature (I'm thinking of Sarah Orne Jewett's The Country of the Pointed Firs, which is full of both doughnuts and pies! ), pie and doughnuts were traditional rural foods, consumed for both dessert and for breakfast. I wonder when and where doughnuts became more of a standard breakfast item than a dessert? This whole post wasn't just an excuse for me to use the pie blog plug my friend Amy's donut zine release party tonight, but I'll let these Maine woodsmen's pie-and-doughnut pairing serve as one. If you're in DC tonight and want to learn more about and of course, eat some doughnuts (some even filled with pie filling! ), make your way over to the Velvet Lounge at 8pm for "Donut Go There" A Zine Release Party. Tarts by Tarts will be contributing some special edition doughnuts to the doughnut buffet, my friend Pete will deliver a west coast doughnut scene report, Amy will be speaking, bands are playing, I'll be performing this little doughnut ditty, and you can get your hands on one of these zines, free with admission. There wont be pie, but who doesn't love doughnuts?